extent to which he availed himself of its services. Neither "" did he fail to appreciate the value of carving as a means of decoration. He appreciated thoroughly both wood and method, and utilised them as often as their use assisted him towards the attainment of the end he had in view. But he was too enterprising to stop at this point. He bore constantly in mind the fact that other fine hardwoods besides mahogany existed, of choice " figure " and beautiful colouring, and that carving was not the only decorative medium available. As the employment of either on too great a scale was not conducive to the consummation of his desires, he called to his aid every rare wood that could possibly be secured, and, furthermore, set the marquetry cutters, inlayers, and wielders of the brush to carry out the dainty, and generally most chaste, conceptions that were constantly emanating from his exceptionally fertile brain. The above is, I think, a fair, and not by any means too eulogistic, summing-up of the aspirations and methods of this designer, and the outcome of them is to be found in part in the plates which constitute by far the most important portion of this chapter, and without which my notes would be of but small value. In 1751, just three years prior to that in which Chippendale's great book, " The Gentleman's and Cabinet Maker's Director," was first published, there was born at Stockton-on-Tees, of humble parentage, a child who, though destined to a life of comparative penury—such is the irony of fate—nevertheless won for himself in after years, by force of industry and genius, a reputation second to none in the annals of the cabinet-making of that period. He did more to elevate the craft of which he was so proud, in his own and subsequent times, than any man of his or any other age. The story of poor Sheraton's life, or the small glimpse of it that has been accorded to us, is indeed full of pathos. It is far from easy to obtain biographical details of our eighteenth-century cabinet makers. In most cases none is available ; but of Sheraton, fortunately, a few particulars have been handed down to us. 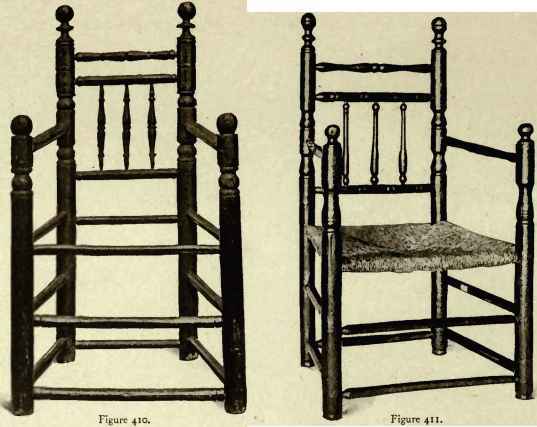 Though somewhat meagre, they are nevertheless of intense interest to all earnest students of the history of the furniture of the Georgeian Era who are not content to regard these old household gods merely as examples of more or less admirable craftsmanship, but who desire to look beneath the surface—to know something of the conditions of the times in which they were made, and, if possible, to try and conjure up some picture, however vague and shadowy, of the lights and shadows of the lives of the men who designed and made them.